Why Bully Proof and not Anti-Bully? 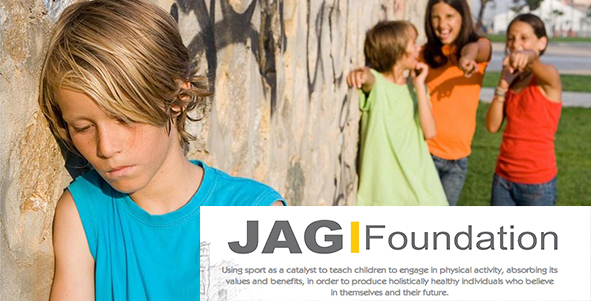 JAG Bully Proof uses rugby to tackle the problem of bullying. This initiative was developed and successfully implemented by Leicester Tigers UK. More than 11,000 children in grades 4 – 7 from 25 schools (BONTEHEUWEL: EA.Janarie, Arcadia, Bergsig, Boundary, Nerina, Klipfontein, Cedar, Central Park, Mimosa, Bramble Way, Montana, Protea, Disa, Rosewood. MITCHELLS PLAIN: Mitchells Plain, Jamaica, AZ Berman, Portland, Parkhurst, Yellowood, Tafelsig, Littlewood, Beaconview and Eastvill) experience the JAG Bully Proof programme each year, with 7,800 children having already gone through our complete programme since 2009.